In Connecticut, Red Cross training is designed to meet the needs of our communities and help those who live here learn new skills and prepare for emergencies of every size. Whether you're a parent or teacher, a teenager or senior citizen, concerned citizen or healthcare professional you'll find Red Cross training in Connecticut that's designed to suit your needs and your learning style. At the Red Cross, we offer first aid classes in Connecticut that are convenient and accessible. With training opportunities available in dozens of communities and online, you can easily find a class that's not only near your home, school or office, but also works with your schedule. Explore the most up-to-date list of Connecticut first aid certification courses from the American Red Cross. In Connecticut, first aid certification classes from the American Red Cross are delivered in a variety of ways. For full certification that's also OSHA-compliant, it's important to enroll in our in-person or blended Simulation Learning courses, which allow you to demonstrate your skills to a trained instructor. For individuals who don't need an OSHA-compliant certification, we offer online courses that allow you to learn at your own pace and practice your skills via our interactive coursework. In-person Connecticut babysitter certification classes from the American Red Cross deliver the latest information to help you care for children when their parents can't be with them. From first aid and managing behaviors, to choosing age-appropriate activities, our courses can prepare you for what lies ahead. Best of all, our caring, knowledgeable instructors will answer your questions, help you work through scenarios, and share their own stories, so you can become a capable, confident babysitter. Take babysitting classes in Connecticut from the nation's leader in babysitting and child care training. With best-in-class in-person and online courses designed to help you keep kids safe, understand and manage behaviors, choose age-appropriate activities, and more, our experts can help you become one of the most in-demand babysitters in your neighborhood. Embark on a rewarding, meaningful career. Take CNA classes in Connecticut from the experts at the American Red Cross. With in-class and hands-on experience, our program can help you gain the skills needed to provide care in a range of settings – and can help prepare you for the Connecticut CNA certification exam. Connecticut CNA training from the American Red Cross is only available in person. Taught by experienced, licensed professionals, our courses are designed to help you understand the theories and best practices used when providing patient care. Classes are small, held during daytime hours, and take four to eight weeks to complete (including in-class work and clinical rotations). After completing the course you will be ready to take your licensing exam and begin your career in the medical field. Whether you're training for a job or simply want to be prepared to help, Red Cross lifeguarding classes in Connecticut can help you gain the skills you need to do it all. Our expert instructors can help you learn to prevent, recognize and respond to aquatic and medical emergencies in a range of settings. When you chose in-person lifeguarding classes in Connecticut, you'll join others from across the state for lectures and hands-on skills sessions. All classes are taught by trained, experienced professionals who can answer your questions and help you become a capable, confident lifeguard. In-person classes take approximately 25 hours and are delivered over the course of several days. 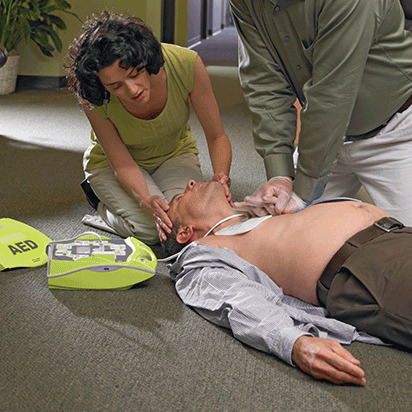 Connecticut AED training from the American Red Cross can help you learn the skills that can help save a life. On average, first responders arrive on scene 8 to 12 minutes after 911 is called, however during sudden cardiac arrest, each minute that defibrillation is delayed reduces someone's chances of survival by approximately 10%. By taking AED classes in Connecticut you'll be prepared to help when it's needed you most. AED training in Connecticut takes just a few short hours to complete, but can help save a life when every minute counts. With in-person, online, and our blended Simulation Learning, which combines online coursework with in-person skills sessions, you can train the way that suits you best, and get the experience you need to deliver care during times of crisis. The American Red Cross delivers Basic Life Support (BLS) training in Connecticut that can help you deliver the right level of care when and where it's needed. By blending reading and lecture with hands-on experience, our Connecticut BLS classes allow you to learn new techniques and sharpen your skills so you can provide those in need with the best possible care. The American Red Cross offers a variety of ways to complete your BLS training in Connecticut. From classes designed for healthcare providers and first responders, to courses developed specifically for your department and your local protocols, we can help you earn the certification you need. Regardless of how you train, our BLS curriculum includes all of the standard scientific learning objectives necessary in professional resuscitation courses, as well as sections on teamwork, critical thinking skills, reflection and debriefing. Take CPR classes in Connecticut from the experts at the American Red Cross. Although they take just a few short hours to complete, our CPR training will empower you to provide assistance during emergencies, and can help you save a life. When you choose in-person AED, First-Aid and CPR classes in Connecticut from the American Red Cross, you'll join others from across the area for training from experienced, licensed professionals. Part lecture, part hands-on skills session, our in-person classes give you plenty of time to ask questions and become comfortable with the processes and procedures involved when providing care.